3D printing, as the name suggests, is a means of creating solid and indeed hollow shapes, from a design on a computer. The models are printed by a machine (the 3D printer) that extrudes heated plastic filament, building the desired shape in runs and layers. 3D printing in an educational context can enrich a wide range of disciplines – IT, engineering, DT, Science, Art and Maths. At EduMake we run a variety of 3D printing workshops for students including the “3d printing in 5 minutes” workshop where students are given the opportunity to build there very first 3d model, from concept to finished article, with the design phase on the computer taking just 5 minutes input from the student. This workshop generates excellent student engagement and can be a great initiator for longer projects. 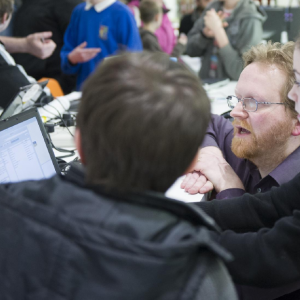 In these workshops, the software we use is exclusively free and open source, giving the students the opportunity to develop their 3D modelling skills outside of our workshops. One tool in particular (openscad) gives the students an introduction to designing models in a precise procedural manner, linking well to both engineering and programming skills. Register your interest in this session.